The month of January saw a continuation of 2014 year-end market trends. Crude oil continued its decline, shedding another 12.5%. Energy-induced volatility helped drag down the equity indices, with the S&P dropping 3.0% and the Russell 2000 losing 3.3%. The 10-Year Treasury started the month yielding 2.17% and ended at 1.68%. 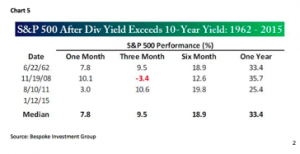 Between the fall in the 10-Year Treasury yield and the fall in the S&P 500, last month marked a notable stock market occurrence. 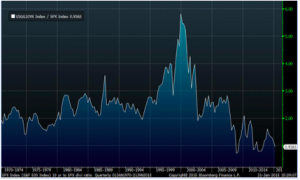 January 2015 will go down in the history books as just the fourth time since 1960 that the yield on the S&P 500 exceeded that of the 10 year Treasury. Note that for most of the period between 1980 and 2007 the 10 year Treasury yield was between 2.0 times and 2.9 times that of the S&P 500. Many view this as a perversion, or distortion imposed on markets by the Federal Reserve Bank’s low interest rate policy. That may be a worthwhile debate for policy analysts to have (we think concerns about low rates are misguided, but that has been a longer conversation that we will leave out of this particular commentary), but as asset managers we must deal with the world in front of us irrespective of whether we think it is justified or not. Lower interest rates have a huge effect on companies. Too many express their disdain for lower rates alongside the boost they give to valuations without considering the micro consequences. Note that each time the yield of the S&P 500 exceeded that of the 10-Year Treasury, the S&P has rallied strongly over most timeframes. A sample size of three is certainly not a robust data set; however, it is worthwhile to think about why this situation has been good for stocks in the past. A huge pool of global assets is managed with a pre-defined split between stocks and bonds that is rebalanced when allocations veer too far in either direction. As Treasury yields make a big move lower, the principal value rises. When this happens alongside a sideways or down stock market, there is a powerful bid in stocks from the reallocation. Further, consider the decision certain allocators who may not have pre-defined stock/bond splits but do have annual income targets face (an endowment fund might be an example of this). When the yield on the S&P is greater than that of longer-dated Treasuries, one can make more progress on your income goals, while adding potential capital appreciation to the portfolio in the stock market. As shown above, this opportunity does not present itself very often. The risk side of the coin is that such a fund may have more volatility in its value; however, a long timeframe mitigates that problem to an extent. None of these situations are clear-cut. Certainly many active allocators faced with such a dilemma make differing choices based on their own institutional constraints, but this effect is unquestionably a stimulus to stocks. One must be a realist and look at the actual, factual influence that interest rates play in the cost of capital for a company. Low interest rates, as is evidenced in various arena, allow borrowers to tap into capital at a lower cost. Rates at some point will eventually rise and raise the cost of capital. However, given the length of time of low interest companies had ample time to finance themselves cheaply and lock in rates for the long-term. The early years in a rising rate regime will be somewhat mitigated by companies already having secured low rate financing…. In our 2015 Investment Outlook, we explained that we will no longer write out our leaders and laggards on a quarterly basis. We asked for suggestions of better ways to incorporate an overview of the companies in our portfolio and particularly liked one suggestion we received from a client to briefly review new positions as we initiate them in portfolios. In perusing the energy sector for value opportunities, we asked ourselves “what are some companies or sectors that have been unjustifiably punished alongside the carnage in oil?” The answer had us exploring several alternative energy companies, a few banks, and one real estate company that looked particularly attractive: Howard Hughes Corp (NYSE: HHC). Howard Hughes came into being as a carve out from General Growth Properties’ bankruptcy reorganization. The founder and Chairman is Bill Ackman, one of the best hedge fund managers today. Ackman and insiders own about 13% of the company, with Horizon Kinetics owning 13% awe well. In other words, there is a stable, long-term oriented investor base. HHC owns several unique properties that are undergoing transformations right now, making it very challenging to model exactly what their future income stream will look like. Regardless of the exact path, we do know there is immense value. Overall, the risk long-term is fairly low, though when and how the upside materializes is challenging to say with precision., This is a company that cuts at the distinction between risk and uncertainty, where risk is defined as situations in which we know what the distribution of potential losses looks like, while uncertainty is when we do not know what the distributions look like. We like low risk, high uncertainty situations where it’s clear there will be value, but unclear exactly how much. The properties, in order of their potential value that attract us to this situation are: the South Street Seaport in Manhattan, the Woodlands in Houston Texas and the Ward Center in Hawaii (which the company describes as their “crown jewel.” In addition, HHC owns a slew of other properties, including a valuable Master Planned Community in Howard County, Maryland and major tourist attractions like the Riverwalk in New Orleans. The South Street Seaport is undergoing extensive renovations and will be re-leased to premium shops starting in late 2016, early 2017. It is conceivable that five years down the line, the Seaport alone, with its potential 600 square feet of leasable space ends up worth more than the entire market cap of the company today. The Woodlands in Houston is one of the finest Master Planned Communities in the country, yet, this property is specifically why the stock has been so hard hit of late. The company’s own build-up of net asset value and analyst estimates put a value on The Woodlands at near one-fourth of HHC’s total asset value. Houston is associated with the energy boom and people fear there will be further pain for energy companies. Mr. Market has essentially written off the value of the Woodlands. While we do think energy companies are in for a tough go, it is important to think about who HHC’s tenants will be. Exxon’s new 10,000 acre campus is starting to open and will be fully operational next year. They are pre-committed to a lease that will generate $15m in annual net operating income for HHC. Exxon’s credit, despite the energy woes, is as good as they come. Some neighboring residential properties may be at risk of lower realizable values, but the market has simply moved too aggressively in discounting HHC’s “energy exposure.” All in all, we think the energy-related risk is largely overstated, and the elite properties the company owns in Houston will yield considerable growth down the line. The Ward Center in Hawaii already generates over $25m in annual net operating income. More interestingly HHC is building residential developments that have pre-commitments of purchase for 75% of the units. Deposits already in (which are counted as liabilities today, but will shift over to revenue once done) are over $100 million, with purchase commitments of over $700 million. There will also be additional commercial space available for lease. As of today, HHC is not organized as a REIT. This is so because the company is using its income in order to invest in these transformational properties. This is a shrewd move, as it affords maximum flexibility to take advantage of the over $300m in net operating losses received in the carve-out from GGP. Once the transformations are done and the NOLs are used, the company then can convert into a REIT, which will greatly lower their cost of capital and turn HHC into an excellent yield vehicle to own. As we have done with several investments, we like to look at the out-year earnings and yield potential and see a huge opportunity for time arbitrage. This entry was posted in 2015, Commentary on February 6, 2015 by RGAIA.